Opposites Attract: Does the Lenovo-NEC Japanese Joint Venture Make Sense? "One plus one may not equal two," says Tomoo Marukawa. Not a philosopher, but rather a Chinese economy specialist at Tokyo University's Institute of Social Science, Marukawa is sizing up a new joint venture (JV) between two big names in personal computing — China juggernaut Lenovo and Tokyo-based NEC. Ever since the JV was announced in late January, commentators like Marukawa have been wondering what's to be gained by the IT rivals pooling their PC businesses in Japan. It's true that both firms are coming to the deal from two different vantage points. As China's biggest PC company, Lenovo is also the fourth-largest in the world by shipments with a 10% market share, having burst on to the global scene with its acquisition of North Carolina-based IBM six years ago.In contrast, NEC — an industry pioneer credited with introducing the country's first PC in the late 1970s before expanding worldwide — has spent recent years retrenching, shuttering its European operations and shedding thousands of staff, leaving the struggling enterprise with a global market share of just 0.9%. "What extra value can NEC offer Lenovo?" asks Marukawa. "Look at the Sony Ericsson mobile phone joint venture. They had complementary assets — Ericsson's telecoms technology and Sony's audiovisual technology and its brand. NEC and Lenovo are making the exactly same thing, [but] with two different cultures." The Lenovo-NEC deal also raises broader, more general issues, too, about deal-making strategies in today's post-recession era. As growth becomes increasingly tough in mature markets like Japan, emerging markets are revving up — Lenovo's emerging market division posted revenue growth of 34% in the third quarter, compared with 22% in its mature markets. More and more emerging market companies are also spearheading growth initiatives outside their borders, following Lenovo's lead. In its latest deal, Lenovo has paid its new Japanese partner US$175 million in shares for a 51% stake in the JV and an option to buy out NEC's 49% for US$275 million in 2016 if various performance metrics are met. Beyond that, the aim of the Japanese venture appear straightforward enough: Maximize combined sales, distribution and supply chain networks throughout the country and cut costs by increasing scale, a critical step in an industry notorious for its razor-thin margins. For all the strengths that Lenovo brings to the JV, NEC has something it doesn't — a bigger, more secure foothold in Japan, the world's third-biggest PC market where shipments in 2010 rose 17% to 15.27 million units. Last year, NEC held 19.5% of that market, making it number one in the country, ahead of Fujitsu (19.4%), Toshiba (11.7%), Dell (10.2%) and Japan HP (9.7%). Lenovo is far behind, neck and neck with Sony at 6.1%, according to MM Research, a Japanese market research firm. Indeed, while Lenovo is strong in developing markets, it has had less success in mature markets, including Japan. Like Chinese brand leaders in other sectors, Lenovo has struggled to crack the Japanese market, even after acquiring IBM's PC business there. Before Lenovo's takeover in 2004, IBM Japan sold 890,000 PCs locally; in 2009, sales were less than half that, at 390,000. That was less a reflection of a tumbling global economy than of its failure to win the confidence of many of IBM's Japanese customers. According to Kanae Maita, a Japanese PC analyst for IT research firm Gartner, Lenovo's decision to form a JV with NEC rather than to buy its PC business outright is a reflection of the challenges that Japan poses for it. "Lenovo learned its lesson from the IBM Japan experience," she says. Not only does NEC have a bigger market share than Lenovo in Japan, it also brings a portfolio of contracts with large local companies and government entities, something that gives the JV "a very tangible value," says Steven Zhang, a technology analyst at DBS Vickers Securities in Hong Kong. Lenovo has most likely betting that joining forces with a well-respected local JV partner is a smart way to allay Japanese consumers' sensitivities about its growth ambitions in their country, says Saikat Chaudhuri, a professor of management at Wharton. "People are sentimental. That's why, for example, when Air France bought KLM [of the Netherlands in 2004], it was called a 'merger'…. NEC was the first PC maker in Japan and it has loyal clientele. Their reaction would be negative if it was a buyout." Another way to hang on to old customers: Initially, Lenovo and NEC products will be marketed separately. Chaudhuri notes that has less to do with territorial frictions than with cultural issues. While Chinese companies tend to focus more on high-volume, low-margin manufacturing and less on innovation, Japanese firms "are very meticulous about product innovation and process, continuous improvement, and keeping good relations with suppliers," he says. The Lenovo deal isn't the first time NEC has moved a poorly performing part of the company into a JV. Last year, it joined forces with locals Hitachi and Casio to consolidate their handset businesses into one venture and then with Renesas Technology to merge their semiconductor units. According to NEC, that strategy allows it to free up resources for more financially promising businesses, such as cloud computing. But NEC's latest JV is with a foreign firm, and one whose culture couldn’t be more different — not just because of the usual crossborder deal issues, such as different compensation structures, customer relationships and management styles. There could also be a clash of their Chinese and Japanese roots. “It will be hard to manage the two cultures," says Zhang of DBS. “Lenovo is a very progressive and international company, while NEC is a very domestic Japanese company," and very traditional, he says. Unlike Toshiba and Sony, for example, NEC keeps a tight grip on its subsidiaries, and has avoided appointing non-Japanese to top management positions overseas. As for the Lenovo-NEC JV, the senior ranks will be a judicious combination of Lenovo and NEC executives. Hideyo Takasu, currently president of NEC Personal Products, will become the JV's president and CEO when it launches later this year, while Roderick Lappin, Lenovo Japan's president, will be executive chairman. Of course, market share is one thing; profitability is another. Lenovo's filing to the Hong Kong Stock Exchange, as part of the JV announcement, reported that the NEC unit that includes its PC business posted a net loss of 5.5 billion yen (US$6.7 million) after taxes and special items in the financial year ended March 31, 2010.Its group results for the third quarter ended December 31st were equally unenviable, with sales falling 12.7% from the previous year to 720.7 billion yen, and its net loss widening to 26.5 billion yen from 9.6 billion yen. Rival Japanese electronics makers, meanwhile, fared better. "Unlike Toshiba, Hitachi and Fujitsu, NEC was slow to remove its loss-making business from its core segments," says Masahiro Katayama, Japan-based PC group leader at IT research firm IDC who worked for both IBM and Lenovo in Japan. Left unchecked, NEC's underperformance could test Lenovo's patience, particularly now that it has only recently turned a corner itself. Although the IBM acquisition made it the world's third-largest PC maker, it slipped to fourth place with a 7.6% world PC market share in 2008. Then the financial crisis hit, battering computer sales. After Lenovo reported a loss of US$97 million in the third quarter ending December 2008, company founder Liu Chuanzhi returned to the helm, taking over from former IBM chief William Amelio. Since then, the North Carolina-based company's fortunes have turned for the better. Lenovo’s October-December net profit rose 25% to US$99.7 million, up from US$79.5 million a year ago. Operating profit margin rose to 2.2% from 1.9% in the previous quarter, boosting Lenovo's earnings. Its gross profit margin — or the percentage of sales left after deducting the cost of goods sold — widened to 11.2% last quarter from 10.3% three months earlier, Lenovo said, partly because of its ability to take advantage of declining costs for components such as memory chips. Thanks to economies of scale, the JV will also help the two partners win in terms of costs, a particular boon for NEC, says Kanae Maita, a Japanese PC analyst for IT research firm Gartner. According to her, "NEC could benefit greatly from cutting per unit costs by tapping Lenovo's worldwide networks for procurement of parts and materials." While the JV is focused on Japan, is geographic expansion also a possibility? It's too soon to say, but NEC might be hoping so. NEC's 1995 purchase of U.S. computer maker Packard Bell made it the world's second-largest PC maker. But it was no match for the big push by Gateway, Dell and Compaq with their lower-priced PCs, equipped with standard Microsoft Windows software and Intel micro processing chips. NEC withdrew from the U.S. PC market in 2000 and left other overseas markets completely by 2009. But what both JV partners need most is innovation, say industry observers. The JV's success depends on whether it manages to not only make cheaper PCs and notebooks, but also roll out new features. "If they cannot beat Dell or HP in terms of price, and they do not develop special products, their share is likely to decline. I am a bit pessimistic," says Marukawa. What fate lies ahead for the JV? According to Mergermarket, JVs with Chinese companies in Japan area rarity, with only a handful recorded over the past 10 years; more common are Japanese JVs in China, largely due to the latter's foreign ownership regulations. Until recently, it also was rare for aChinese company to acquire a Japanese company. But times are changing. Chinese companies bought 37 Japanese companies in 2010, up 43%, according to Recof, a Japanese M&A advisory firm. NEC's president, Nobuhiro Endo, has rejected speculation that the company will sell its share in the joint venture. When asked during the press conference unveiling the JV about whether it will eventually be 100% Lenovo owned, he said, “There is no such discussion.The purpose of the joint venture is to create maximum potential with our mutual synergy and contribute to the market. We will seek other possible tie-ups besides this joint venture.” One possible tie-up already being discussed in the press: Servers. 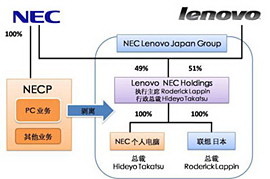 Masato Yamamoto, head of NEC’s platform business, acknowledged as much in a press briefing in early February, noting that such a tie-up would give NEC access to China's market, where it doesn't have a strong presence, while allowing Lenovo to diversify. But with or without new tie-ups, NEC shouldn't rule out a sale of the PC JV. "It is in a good, dominant position in an important market now," says Wharton's Chaudhuri. "It is much better to sell [under the JV's agreement] than if it were in a distress sale and struggling." NEC's Chinese partners might agree. "Lenovo will in the end take over the whole business in five years, depending on the profitability of the joint venture," predicts Zhang of DBS. "I believe that is the intention of Lenovo's management."